Deputy Daniel Carter (Aaron Poole) finds a blood-soaked man on a deserted road, and promptly rushes him to the local, understaffed hospital. Following this, figures cloaked in white surround the hospital, while the inside is subject to mysterious and violent occurrences. It's evident what's the films greatest achievement, and that's the effects. What's brought to the screen are a loving throwback, evidently inspired by the practical effects that were commonplace in 80's horror films. This element is placed front and centre, and is fantastic to bear witness to. Difficulty lies in caring for these characters, when their backgrounds and character relationships are barely explored. What we're left with is a group of stock cliches, including genre favourites such as the deputy dealing with a personal loss, the mysterious outsiders who are of great help, the pregnant plot device, and the antagonist that's mainly composed of monologues. Credit where it's due, the cast do a fine job bringing alive their thinly sketched roles. Directors Kostanski and Gillespie bring a willingness to flip between genres, and it surprisingly works in this films favour. Beginning as a hospital set survival horror, easily the films weakest portion, turns into something stronger about halfway through. The germ of an idea is evident, as the film becomes a hellish descent into a horrifying setting. Sadly, it all fails to come together in a satisfying way, but you can't fault the attempt, to deliver something more than a bog standard horror film. There's clear appreciation for the horror genre here, with the directors drawing inspiration from the practical effects fronted flicks from the 80's. 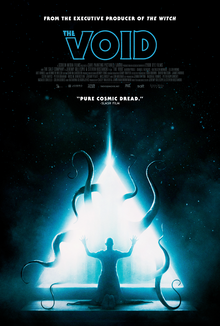 Whatever genre reverence is evident here, it's a shame The Void fails to bring it all together. The practical effects are strongly done, but seemingly at the cost of reasons to care for the characters.